Select an option Ruffle shirt 12 mo Ruffle shirt 18 mo Ruffle shirt 2T Ruffle shirt 3T Ruffle shirt 4T Ruffle shirt 5T Ruffle shirt 6T Ruffle shirt 8 yr Ruffle shirt 10 yr Ruffle shirt 12 yr Bodysuit 6-12 mo. Bodysuit 12-18 mo. Happy 1st Birthday! This darling first birthday shirt is perfect for any girl. Complete with ruffle sleeves and a ruffle waistline this appliqued shirt has a large pink and white polka dot one and a beautifully embroidered name in gold. Also available with a letter instead of a number. Perfect for any little princess! Special thank you to @ohhappyplay for the wonderful photos!! Thanks for taking a peek into Gentry CA! Please be sure to "favorite" my shop to ensure you see all current listings! So excited when this arrived! Quality of material was beyond expectation and promised rush delivery was met. Won’t hesitate to order from here again,! Easter Bunny shirt with name. Polka dot bunny rabbit shirt. 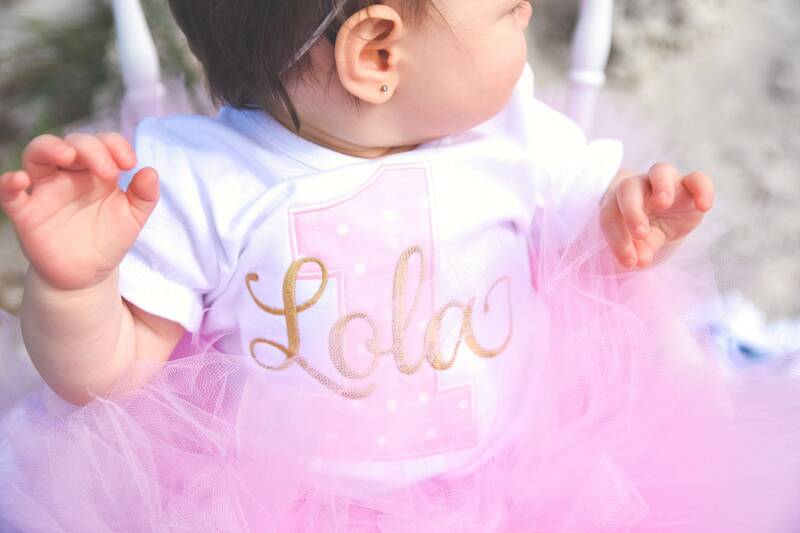 Infant bodysuit, little, baby girl shirt with personalized name. Easter Spring.